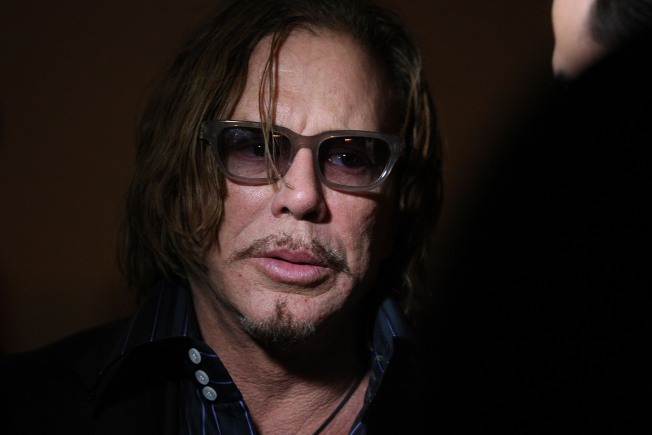 Mickey Rourke either really likes gorillas, or really dislikes Courtney Love. When, just in time for Valentine's Day, Mickey Rourketold reporters he'd "rather be on a desert island with a gorilla" when asked if he was dating Courtney Love, many might have assumed this was typical celebrity-couple subterfuge. A twisted Rourke-world rendition of "We're just good friends." Maybe it was just wishful thinking, but when reports of a secret relationship surfaced, people seemed to be hoping that the battered Love and the-even-more-battered Rourke had found each other. After all, they are perfect for each other, right? Then Rourke puts the kibosh on the whole thing by saying he'd rather liplock with a dead Xanaxed chimp. Rourke has toted his tiny-pocketbook chihuaha all over Fashion Week, so no dice there. But still there was hope. Maybe they'd come out together at the Oscars in one mass of gold-statuette dragging silicone-injected scar tissue. Then Vulture crushes everyone's dreams once again, by reporting — after asking him at Domenico Vacca's show at Bryant Par k— that Rourke would be bringing something worse than a killer chimp to the Oscars this weekend: his agent.